Thank you to everyone who donated this year! Check back next December for Toyfund 2019! The Daily Hampshire Gazette’s Sidney F. Smith Toy Fund provides certificates redeemable at participating local retailers to eligible families who can use them to buy holiday gifts at participating stores through Dec. 31, 2018. Named after a former business manager at the Gazette, the fund began in 1933 to help families in need during the Depression. Today, the fund distributes vouchers worth $40 to families for each child from age 1 to 14. Eligible families must live in any Hampshire County community except Ware, or in the southern Franklin County towns of Deerfield, Sunderland, Whately, Shutesbury and Leverett. Berkshire Children & Families at 220 Russell St., Suite 200 in Hadley, MA 01035, verifies families’ eligibility and the Gazette covers costs associated with the drive, freeing all donations to fund the vouchers. The following stores are participating this year: A2Z Science and Learning Store, 57 King St., Northampton; Deals & Steals, 1 Pearl St., Northampton; JCPenney, 341 Russell St., Hadley (store only); The Toy Box, 201 N. Pleasant St., Amherst; Target, 367 Russell St. Hadley (store only); Sam’s Outdoor Outfitters, 227 Russell St., Hadley; Odyssey Bookshop, 9 College St., Village Commons, South Hadley; Wilson’s Dept. Store, 258 Main St., Greenfield; World Eye Bookshop/Magical Child, 134 Main St., Greenfield. Donations to the Toy Fund may be dropped off at or mailed to the Daily Hampshire Gazette, P.O. Box 299, Northampton, MA, 01061, or made through Gazettenet at https://toyfund.gazettenet.com. 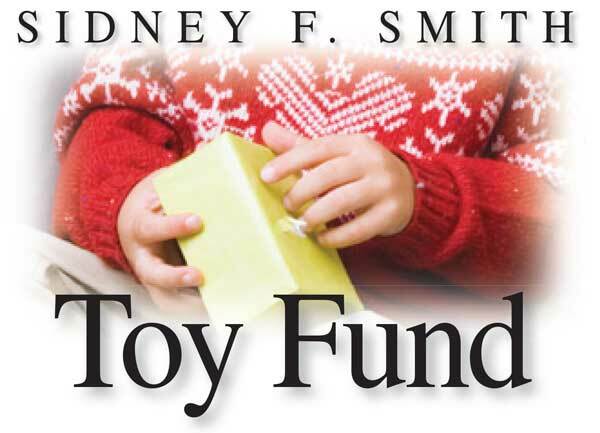 Checks should be made payable to the Sidney F. Smith Toy Fund.